Today’s Friday Photo takes us a building located on Smallbrook Queensway and one that was key in the city’s Inner Ring Road scheme in the 1950s. 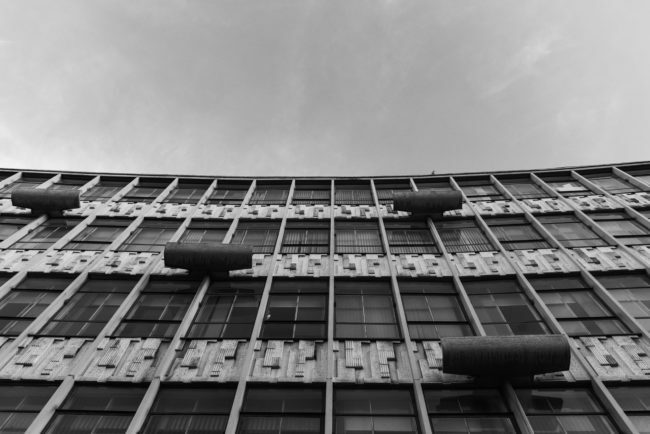 The Ringway (formally known as the Ringway Centre) is a locally listed building designed by architect James Roberts and was completed in 1962. Roberts also designed another iconic Brummie building you’ll be familiar with, and one that’s a stone’s throw from this – the Rotunda. Although the building does divide opinion, many would describe it as beautiful Brutalist architecture that represents a key period in Birmingham’s development. However, today the building is apparently not able to attract a high enough commercial and retail rentable value, and as such there are plans to part-demolished and part-reclad the building in an effort to make it more ‘attractive’. The fear is that Birmingham is a city that has lost many of its iconic buildings of the past, and as we more ‘forward’ in the words of our city’s motto, is this really progression? I really do believe that this building is misunderstood. When you actually get up close and take the time to look up, you can see the delicate detailing in each concrete panel and the unique artistry hidden from street view. A feature often overlooked.